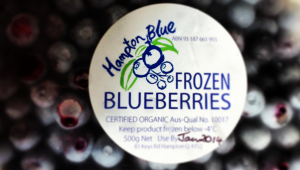 Frozen blueberries – 500g of goodness! Yep, when the season’s over we still have a few frozen organic blueberries in 500g containers available for all you lovely folk out there! Contact sue@hamptonblue.com.au if you need any!